This is FRESH AIR. Instagram, Twitter, Pinterest, the web - they're all teaming with quotations - some political, some inspirational, some merely wise or funny. A great many are attributed to authors who never said them. Does it matter when we get a quotation wrong? Our linguist Geoff Nunberg says not always. GEOFF NUNBERG, BYLINE: It wasn't a serious political gaffe, but it was awkward. 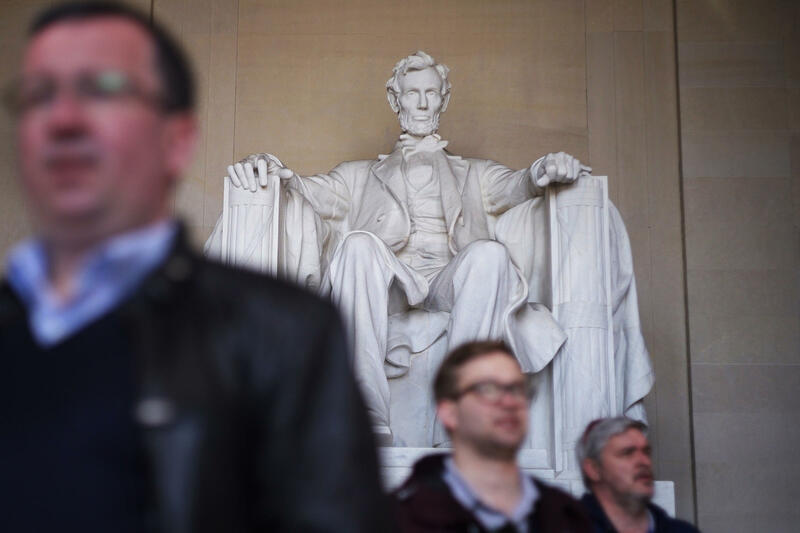 On February 12, the Republican National Committee tweeted a picture of the Lincoln Memorial along with a quote in the end, it's not the years in your life that count, it's the life in your years - Abraham Lincoln. You'd have figured the party of Lincoln would have come up with something a little more consequential than an adage about staying spritely in your declining years. It didn't sound very Lincoln-esque, and people quickly pointed out that he never said anything of the sort. Some people took that tweet as another occasion to deplore the plague of bogus quotations on the internet. That's fair enough, but quotations can be bogus in different ways. Some are purely fraudulent as when people ascribe a modern political sentiment to some historical figure to give it a phony pedigree. It's sort of like slapping a thick coat of varnish on a recent painting and trying to pass it off on eBay as a Rembrandt. The Thomas Jefferson website at Monticello has a whole section reserved for the anachronistic quotations that people have put in his mouth to make him sound like an old-fashioned populist or a modern conservative. And over the years, people have used spurious quotations to create apocryphal Lincolns of every stripe - the Lincoln who opposed prohibition, the Lincoln who championed the rights of labor, the Lincoln who warned against inciting class hatred. But most of the misattributed quotations you run into weren't contrived to deceive anyone. In a new book called "Hemingway Didn't Say That," Garson O'Toole traces the checkered histories of a number of familiar quotations as they're passed along from one speaker to another filched and appropriated and often streamlined along the way. Leo Durocher's remark the nice guys are all in seventh place gets polished into nice guys finish last. Sooner or later, the quotations invariably drift into the orbit of some certified luminary like Winston Churchill or Mark Twain. You could think of those as brand names that provide a guarantee. If Nietzsche said it, it must be deep. If Oscar Wilde said it, it's terribly clever. The origins of these sayings are usually murky. With quotations, even the originals aren't original. On his website, O'Toole traced the adage that the RNC tweeted back to an ad for a 1947 book on aging gracefully by a gerontologist named Edward Stieglitz. But there's similar wording in a 1910 advertisement for a laxative called DeWitt's Little Early Risers that promised to add years to your life and life to your years. It wasn't until around 2000 that the remark attached itself to Lincoln. This is really a new way of getting a quotation wrong. The RNC quotation isn't about enlisting the historical Lincoln as an ally in some modern political debate. This Lincoln isn't a political figure or even a historical one. He's more like a Disneyland animatronic Lincoln dispensing upbeat soda-fountain philosophy. He's the Lincoln who is often quoted as saying people are as happy as they make up their minds to be, which as it happens was attached to him in Disney's 1960 film "Pollyanna." These implausible retributions have flourished in the age of the internet. Visit the quote-a-day websites, and you'll find figures from George Bernard Shaw to Nelson Mandela credited with inspirational bromides that they couldn't possibly have uttered. Sometimes it takes only a slight change in an actual quotation to completely alter its meaning. In his "Life Of Samuel Johnson," James Boswell recalls how Johnson once abraded him from repeating some fashionable platitudes. My dear friend, clear your mind of can't. In recent years, that remark has been reinvented as a motivational slogan simply by inserting an apostrophe before the T of can't to turn it into a contraction. That's all it took to transform it into exactly the kind of fatuous cliche that Johnson urged Boswell to clear his mind of and to transform the most caustic wit in all of English literature into an apostle of positive thinking. We do quotation differently now. Time was when it was chiefly a literary device, a way of weaving an essay or speech into an ongoing conversation with the past. Writers pulled familiar quotations from the pages of Bartletts or novel ones from the literary scrap books called commonplaces that they kept, a kind of pre-digital Tumblr. Emerson said that the next best thing to inventing a good sentence was being the first person to quote it. You might have seen an isolated epigram under a yearbook photo or on the lintel of a library door or as a filler in a snippet magazine like The Reader's Digest, but it wouldn't have made sense to broadcast a single quotation all by itself. It took the internet to democratize erudition and set quotations free. Now they're self-sufficient atoms of wisdom that make their own way in the world, passed along in chain mails, tweeted, posted on Instagram and Pinterest boards, inscribed on bracelets and household items. It's true that the websites of inspirational quotes often make a hash of history. But you'd have to be an awful pedant to spend your time railing at the sloppy scholarship on motivational posters and coffee mugs. As long as they inspire and they console, most people couldn't care less who actually said them. In the words of the Chinese proverb - or possibly the novelist Rossman Layman (ph) or perhaps Gustave Flaubert, it's the thought that counts. DAVIES: Geoff Nunberg is a linguist and teaches at the University of California Berkeley School of Information. On tomorrow's show, Susan Burton had the best of intentions when she was released from prison. SUSAN BURTON: I wanted to be brave, and I wanted to be strong. And I wanted to be successful. DAVIES: Burton talks with us about the obstacles that kept her from starting a new life after prison and how she eventually started a program that houses newly released women in the Watts neighborhood of LA. Hope you can join us. DAVIES: FRESH AIR's executive producer is Danny Miller. Our interviews and reviews are produced and edited by Amy Salit, Phyllis Myers, Ann Marie Baldonado, Sam Briger, Lauren Krenzel, Heidi Saman, Therese Madden, Mooj Zadie and Thea Chaloner. For Terry Gross, I'm Dave Davies. Transcript provided by NPR, Copyright NPR.